The third round opened with four decisive results in 16 games, as Caruana, Mamedyarov, and Karjakin affirmed their places as favorites, winning with the white pieces, while Eljanov achieved a slight upset victory (perhaps more surprising because not only was he lower rated than his opponent, he also played as black). Now their opponents will face must-win games tomorrow if they want to survive to force tie breaks. Here is an overview of all 16 matches, the current favorite, match score, that favorite’s odds of winning, their opponent, and both players’ ratings. Since the highest seed eliminated in the first two rounds was #9, we discussed yesterday what to expect in this round from the top eight seeds. Grischuk, at #7, was Eljanov’s victim and now must try to win with black to stay alive. We give him just a 17% chance to pull that off, and a 56% edge if it gets to tie breaks, so his odds of reaching the next round are quite low. 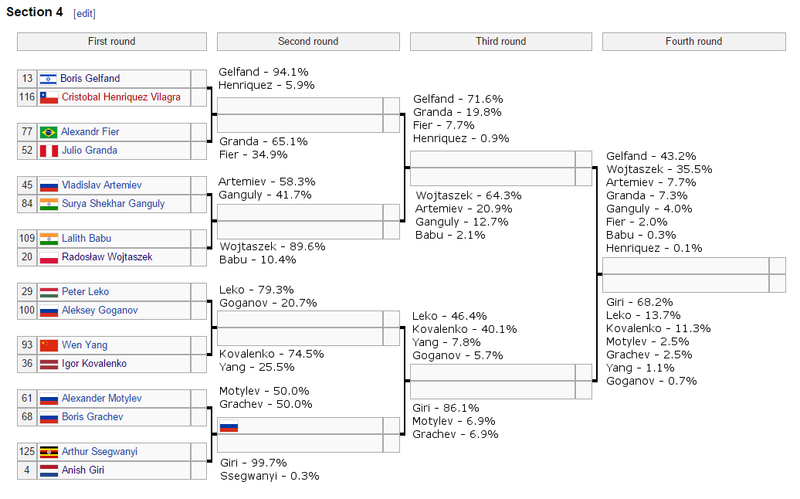 As the other seven in the top group aren’t necessarily safe yet either, we now say there is just a 1.8% chance that all eight will advance to the fourth round. 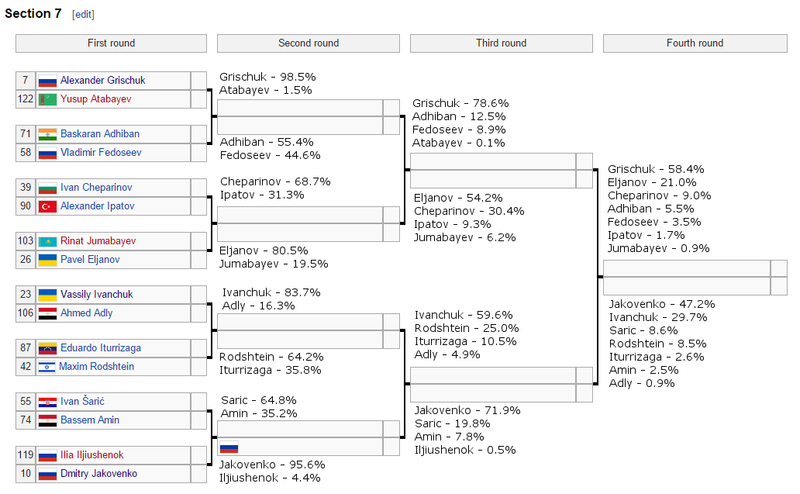 In fact even if we gave up on Grischuk entirely, the other seven would only project to have a 19.1% chance of all advancing. Not only will Grischuk probably be eliminated in the next two days, but at least one other top player probably will be as well, if not more. They’re still ratings favorites, but the opposition is getting tougher. If Grischuk is upset, it will be by a player now ranked 19th in the world in the live ratings. Not exactly a cupcake, and there’s no shame in being knocked out by a player of Eljanov’s caliber. Eljanov, by the way, has climbed the rankings thanks to a perfect 5-0 record so far in classical games at the World Cup, the only player in the field to still boast a perfect classical record at this point. Grischuk is not surprisingly the largest drop off. Not to kick him while he’s down, but in addition to dropping him to just a 1% chance of qualifying for the Candidates Tournament here at the World Cup, this loss also hurt in another way. His projected average rating for the year is now just half a point ahead of Kramnik, who now only needs to gain three more rating points (or see Grischuk lose three more… perhaps by pressing too hard for a needed win tomorrow, and ending up losing instead) in order to catch up for the third place spot on the ratings list. While only the top two from that list will earn a spot in the Candidates Tournament, this race for third remains critical because we currently calculate a 47.1% chance that one of Topalov or Giri, the current top two, will reach the World Cup finals, opening a Candidates berth for the current #3, which is now just barely still Grischuk. 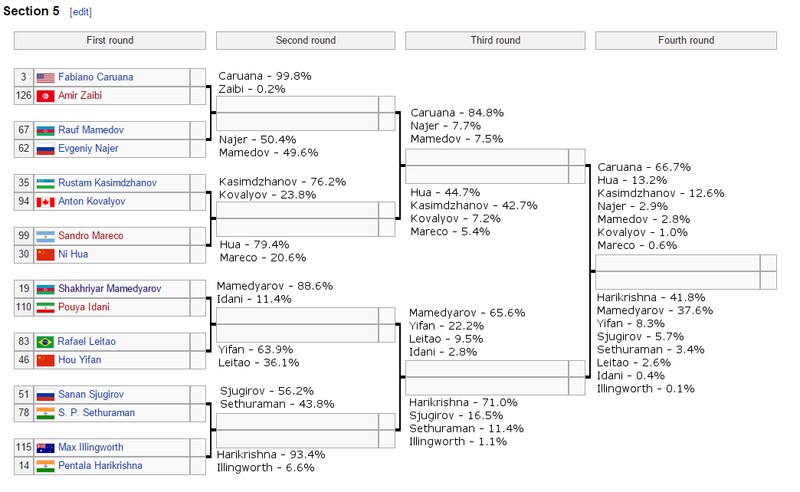 Sethuraman is the only true upset on the list after factoring in yesterday’s games. Lu and Guseinov upset much higher rated opponents to advance to round 3, but they got their wins yesterday and merely had to draw today to clinch their match results. That wasn’t a given, but it was likely enough that they entered the day as favorites. Interesting, perhaps, is that only three matches were decided by 2 – 0 scores. In many cases a player who had won yesterday accepted a draw in a position that, had they needed to, they probably could have won today. 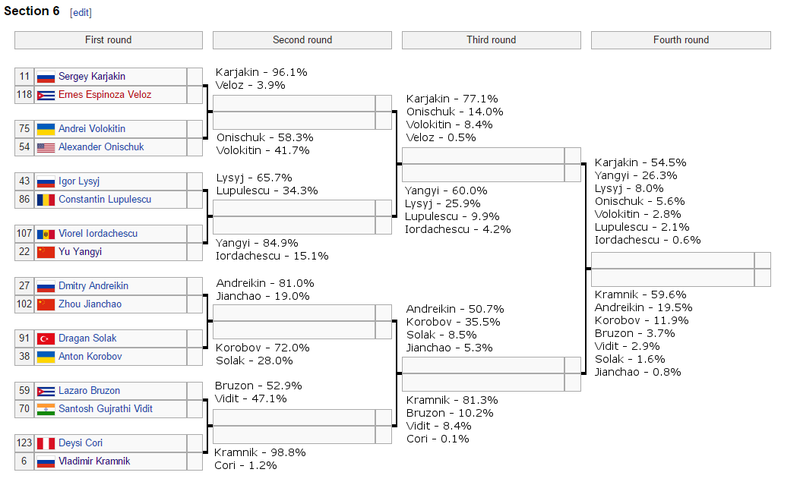 This includes Kramnik, who had a convincing position against Bruzon when the draw was agreed. It will be interesting to see whether he regrets giving away those five rating points (he lost 1.6 for the draw, when he would have gained 3.4 with a win), since as we discussed yesterday he is very close to catching Grischuk for third place in the average ratings list, which could be worth a spot in the Candidates Tournament should Topalov or Giri reach the World Cup finals (now a 46% proposition). Those of you doing the math at home have presumably already realized that 17 decisive matches means 15 matches that will go to tie breaks tomorrow. There aren’t really too many big surprises on this list, as 12 of these matches saw both yesterday’s first game and today’s second game drawn. The odds for an eventual winner in these 12 matches only shifted between 3 and 6 percentage points with the second draw, for the most part all the same people are still favored by about the same amounts. Finally let us consider the broader point: who will the two finalists ultimately be that earn their places in next year’s Candidates Tournament? The full odds for all players left in the field are over on our main World Cup page, but here we will look at who saw their odds shift the most. Using our threshold of half a percentage point gained or lost, there were four players who saw their odds improve significantly on today’s result, and 11 who took significant hits to their chances. Topalov’s gain is by far the largest single-day improvement we’ve seen yet in anyone’s chances here. Why was today such a good day for him? Two key results occurred. 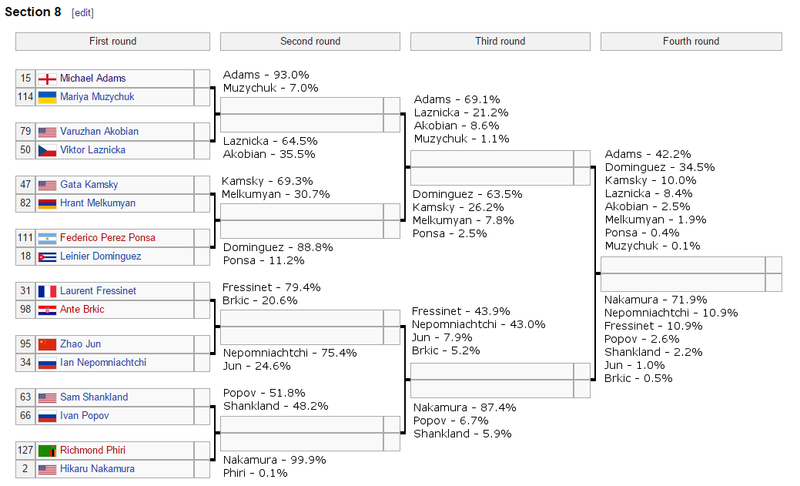 First of all, he won his game (after drawing yesterday) to avoid tie breaks and guarantee a spot in round three, which was previously just an 86% proposition according to our model. That by itself improved his odds to 29.5%, but there are still 2.5 additional percentage points of improvement we need to explain. His other key gain was thanks to Lu Shanglei, who followed up yesterday’s upset win over Wang Hao with a second victory today, clinching his spot as Topalov’s round three opponent. 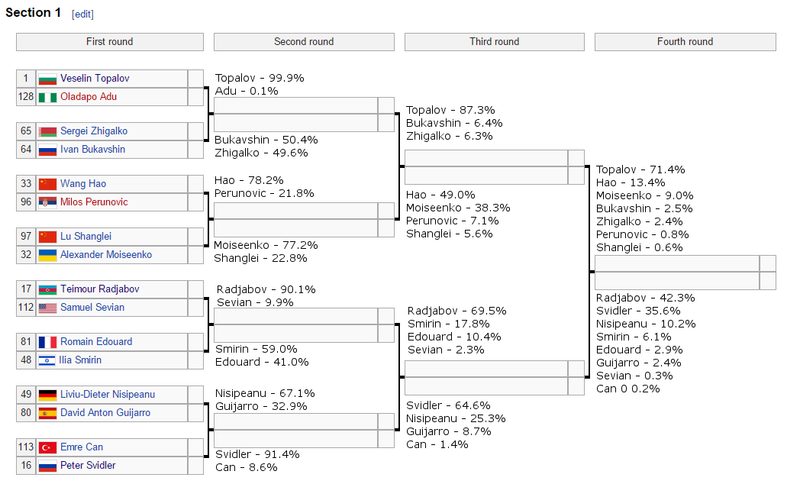 Dodging what we previously saw as a 37% chance Wang would survive brings Topalov’s odds of reaching the finals up to 31%. 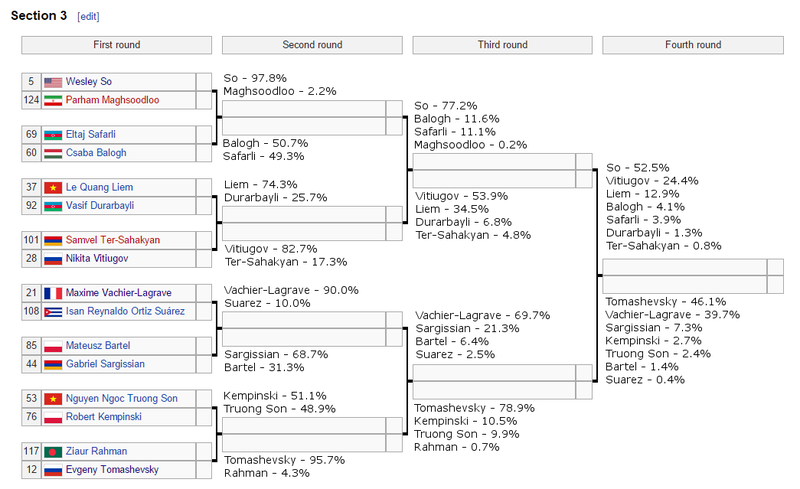 The remaining percentage point is a subtle mix of small factors, but those two games, Topalov and Lu’s victories, were both great news for Veselin’s chances (and for those such as Grischuk and Kramnik who are hoping Topalov reaches the final in order to free up a spot for someone else to qualify by rating). Today was not a spectacular day for fans of upsets. We saw Sethuraman over Harikrishna, but otherwise the top players did marginally better than expected. Navara, at #25, was the next highest seed to fall, and Karajakin and Adams both dodged bullets in must-win games. 12 of the top 32 seeds are now safely in round 3, and we expect to see 10 or 11 more get through out of tomorrow’s 15 tie break matches. With five of the top 10 seeds in action tomorrow it’s still likely we’ll see at least one fall, but their collective odds have improved to 31% that all 10 will advance (and there’s even a 1.4% chance we’ll see them all in round 4). We are seeing some upsets, which was inevitable, but no more than expected. If you were hoping for carnage in the early rounds it doesn’t seem to be happening. That said, the odds are slightly better than 1/3000 that all five of the top 10 seeds in action could lose, so there’s that! Sports fans are notoriously fond of underdog stories. Outside of games or matches involving our personally beloved teams or individuals, we almost always tend to root against the favorite. We love to see upsets! Knockout tournaments are excellent for this, especially in the early rounds. They set up lots of matches simultaneously, and even if each underdog has, individually, less than a 50% chance of winning (by the definition of “underdog”), probability dictates that several of them will likely still win. This is why basketball fans look forward to “March Madness” (the NCAA Tournament) all year, and it’s why chess fans should love watching the World Cup. In the 2013 World Cup, out of 64 first round matchups, the lower seeded player advanced in 13 of those. The lowest seeded player to advance was some kid you’ve probably never heard of, just 14 years old, rated only 2557. What was his name again? Oh yeah, Wei Yi, and come to think of it maybe you have heard of him after all. We do enjoy writing about him here! Not only did he upset Nepomniachti in round one, he went on to knock of Shirov in round two, before finally falling to Mamedyarov in rapid tie breaks in round three. Elsewhere in the bracket we saw the #102 seed (Adhiban) and the #91 seed (Fier) face each other in round two, after both achieving upset victories over their first round foes. Adhiban won the privilege of advancing to the third round, where he was promptly dispatched by Nakamura. #75 seed Daniil Dubov and #89 seed Jon Ludvig Hammer also both reached the third round, scoring two upset victories to get there. And the #50 seed, Julio Granda, scored upsets over Leko and Giri in rounds two and three to reach the round of 16! The point here is that upsets will inevitably occur this time around as well. We can’t predict any specific upset as likely, every underdog (by rating) is by definition expected to win less than 50% of the time, as we said before. We’re not going to highlight any individuals as more likely to overperform than any other underdogs. However we can estimate how MANY upsets are likely to occur, and what the biggest upset might be. We used our model’s odds on each round 1 matchup to simulate the first round 10,000 times, counting how many upsets occurred each time. For these purposes we defined an upset as “the higher rated player loses”, so in a few cases this means the higher seeded player winning is considered an upset, as ratings did shift a little after seeds were determined. Overall we saw an average of 15 first round upsets (median and mode of 14) across our simulations, and one crazy run through gave us as many as 27! We also saw one boring first round with only 3 upsets, but don’t worry, 95% of the time we saw at least 10 upsets in the round, with a 26% chance of 17 or more upsets occurring! Now yes, some of these are less interesting than others. When the 64 and 65 seed play, it hardly matters if Zhigalko (2656) beats Bukavshin (2657), even though that counts in our simulation as an “upset”. Don’t fear, though, we also saw an average of 6 upsets where the weaker player was outrated by at least 50 ELO, with an 18% chance of 9 or more of these “real” upsets coming to pass. We have a 95% chance of at least one 100+ rating point upset (and a 14% chance of five or more, with 10 occurring in a single simulation once out of the 10,000 run throughs). Can we go higher? Sure! There is a 65% chance that we’ll see at least one upset of 150 rating points or more (remember that our largest upset in 2013 was 160 points, and fell in this category). There’s even a 34% chance that we might see someone advance ahead of an opponent rated 200 or more ELO higher, and a 250+ point upset comes in as a 20% likelihood. The latter (a 250+ point upset) would mean one of the top 12 seeds losing in round 1. 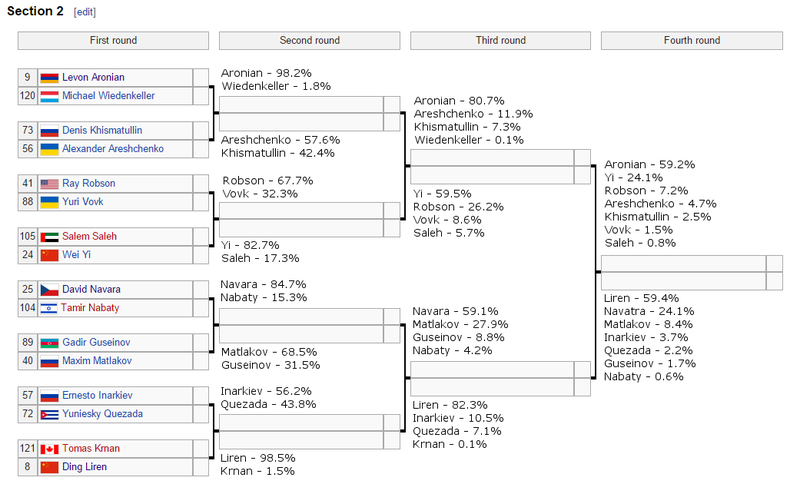 Parham Maghsoodloo, an untitled player from Iran, only has a 2% chance of knocking of Wesley So (his superior by 313 rating points), and GM Ziaur Rahman of Bangladesh gets a 4% shot at beating Tomashevsky (overcoming a 258 point rating gap), and these are more likely than some of the others in this group of 12. Individually they’re extraordinarily unlikely, but the chance that just one of the 12 might succeed aggregates to 20%! Still unlikely, but certainly not implausible! Overall, the largest upset averages out to be 187 rating points (median 182). The mode (single most common value) for our biggest upset comes out at 124 rating points, which is probably because there are two chances for this to happen: #28 seed Vitiugov and #24 seed Wei Yi both outrate their first round opponents by exactly that amount. How ironic would it be if the biggest upset of the tournament this time around were Wei Yi losing to GM Saleh Salem? Salem has a 17% chance of winning, according to our model, although most of the time he does so it isn’t the biggest upset of the tournament!